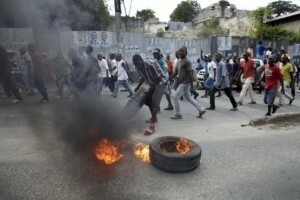 After months of mounting instability and political violence, Haiti now is days away from a full-bore leadership crisis. The way out of the impasse is unclear. What is clear is that the current, failed president, Michel Martelly, must go. Under Haiti’s constitution, Mr. Martelly, who took office in 2011, must step down when his term ends Sunday. However, a runoff election to choose his successor was canceled amid street protests and political upheaval last month, leaving no alternate date for a vote and no plan for a democratic transition. Now Mr. Martelly is suggesting that he may remain in office if there is no consensus on replacing him. That should be a non-starter, given his record of thuggish conduct, mismanagement and poor governance, his contempt for democratic processes, and his complicity in leading the country into its current dead end. Should Mr. Martelly be permitted to retain power, there is every reason to fear that Haiti, with its history of political turmoil, would be in danger of bloody upheaval. The international community cannot allow that to happen. There are a number of conceivable exits from the stalemate. None of them would be easily arranged in the absence of strong institutions and trusted legal bodies in Haiti. Any chance of a peaceful resolution will require timely and assertive diplomacy by the Organization of American States, the United States and other influential international actors. A Haitian former coup leader wanted by the United States for smuggling cocaine called on his supporters on Sunday to resist “anarchists” who forced a presidential election to be canceled — a sign of deep polarization that could lead to more unrest. The former mercenary, Guy Philippe, called for counterprotests and said he would not recognize any transitional government put in place when outgoing President Michel Martelly leaves office on Feb. 7 unless it was representative of the provinces. It was not clear how much support he can muster, but he remains popular in his southern stronghold of Grande-Anse, and the tone of his remarks points to the depth of polarization over the political crisis. 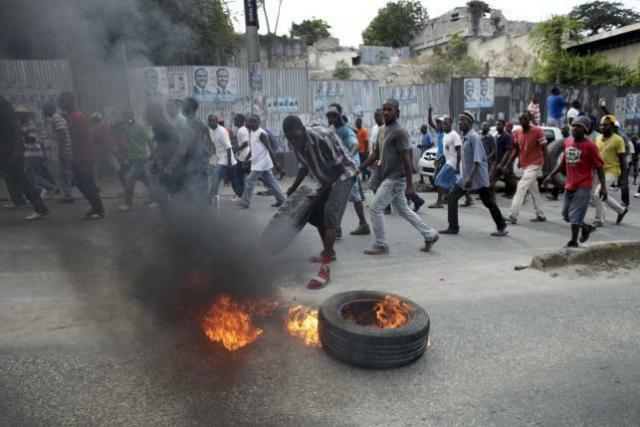 Haiti was due to choose Martelly’s replacement on Sunday, but the two-man race was postponed indefinitely after opposition candidate Jude Celestin refused to participate over alleged fraud that sparked anti-government protests and violence. 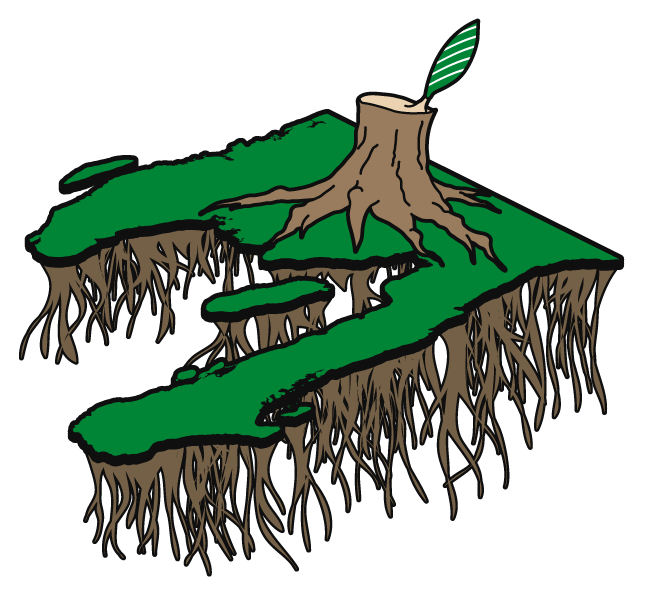 Some form of interim government is likely to be formed to oversee the election process. 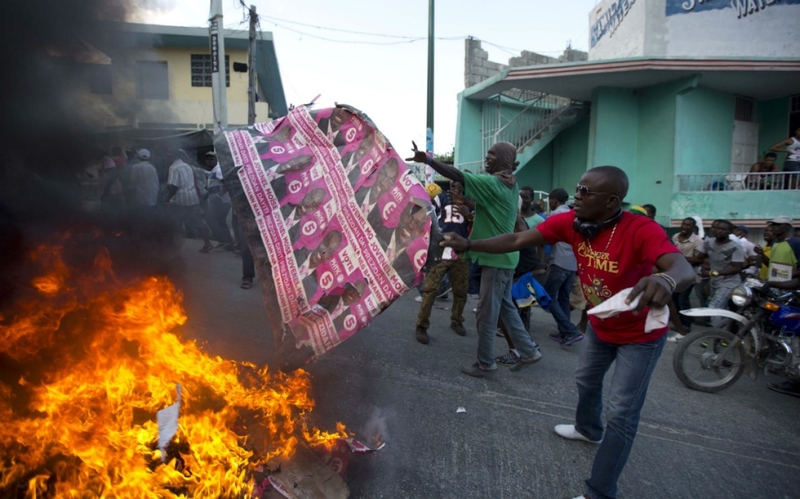 Amid escalating violent protests and attacks on electoral offices around the country, Haitian elections officials Friday afternoon abruptly canceled Sunday’s planned presidential and partial legislative runoffs. “Jan. 24 is no longer opportune for having elections considering the threats against the electoral infrastructure and on the population who would have to go vote,” Pierre-Louis Opont, the president of the country’s beleaguered Provisional Electoral Council said in a five-minute 2 p.m. news conference at the council’s headquarters in Petionville. Minutes earlier, officials had halted the distribution of ballots and other voting materials and began recovery of those that had already gone in day rapidly spiraling out of control as two more elections council member confirmed their pending resignation, and elections offices around the country came under violent attack. The “violent acts” and the verbal threats against elections officials, left the council known as the CEP, with no choice, Opont said as he listed more than a dozen infrastructure that had either been set on fire, or where attempts were made. Among them, he said, was the communal electoral bureau in the northern city of Limbe. It was torched Friday morning. So was the private residence of the top elections official in the nearby city of Pignon. Lawyers for victims of a cholera epidemic in Haiti said on Friday they have served United Nations Secretary-General Ban Ki-moon with a complaint in New York as part of a federal lawsuit seeking compensation for the outbreak, which they blame on U.N. peacekeepers. Ban was entering an event at The Asia Society in Manhattan when he was handed the court papers by a process server, according to a statement by lawyers representing the plaintiffs. A U.N. spokesman, however, said Ban was not served because his security did not allow him to accept the complaint. 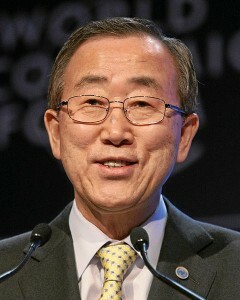 “Ban Ki-moon was served personally. Not wishing to receive what he was given is not a defense, said Stanley Alpert, one of the attorneys for the plaintiffs. “He must now answer or move or be in default personally and for the U.N.,” he added.